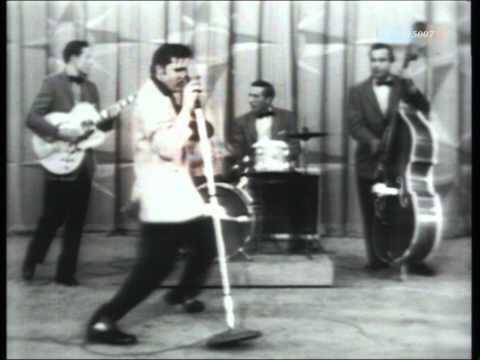 Elvis Presley – Hound Dog (1956) Bereits 1953 ein Hit fuer Big Mama Thornton. Born in Tupelo, Mississippi, Presley moved to Memphis, Tennessee, with his family at the age of 13. He began his career there in 1954, working with Sun Records owner Sam Phillips, who wanted to bring the sound of African American music to a wider audience. Accompanied by guitarist Scotty Moore and bassist Bill Black, Presley was the most important popularizer of rockabilly, an uptempo, backbeat-driven fusion of country andrhythm and blues. RCA Victor acquired his contract in a deal arranged by Colonel Tom Parker, who would manage the singer for over two decades. Presley’s first RCA single, “Heartbreak Hotel,” released in January 1956, was a number one hit. He became the leading figure of the newly popular sound of rock and roll with a series of network television appearances and chart-topping records. His energized interpretations of songs, many from African American sources, and his uninhibited performance style made him enormously popular—and controversial. In November 1956, he made his film debut in Love Me Tender. Conscripted into military service in 1958, Presley relaunched his recording career two years later with some of his most commercially successful work. He staged few concerts however, and guided by Parker, proceeded to devote much of the 1960s to making Hollywood movies and soundtrack albums, most of them critically derided. In 1968, after seven years away from the stage, he returned to live performance in a celebrated comeback television special that led to an extended Las Vegas concert residency and a string of profitable tours. In 1973 Presley staged the first concert broadcast globally via satellite, Aloha from Hawaii, seen by approximately 1.5 billion viewers. Prescription drug abuse severely compromised his health, and he died suddenly in 1977 at the age of 42. Elvis Presley was born on January 8, 1935, in Tupelo, Mississippi, to 18-year-old Vernon Elvis and 22-year-old Gladys Love Presley. In the two-room shotgun house built by his father in readiness for the birth, Jesse Garon Presley, his identical twin brother, was delivered 35 minutes before him, stillborn. As an only child, Presley became close to both parents and formed an unusually tight bond with his mother. The family attended an Assembly of God church where he found his initial musical inspiration. Presley’s ancestry was primarily a Western European mix: On his mother’s side, he was Scots-Irish, with some French Norman; one of Gladys’s great-great-grandmothers was Cherokee. His father’s forebears were of Scottish or German origin. Gladys was regarded by relatives and friends as the dominant member of the small family. Vernon moved from one odd job to the next, evidencing little ambition. The family often relied on help from neighbors and government food assistance. In 1938, they lost their home after Vernon was found guilty of altering a check written by the landowner. He was jailed for eight months, and Gladys and Elvis moved in with relatives. Entering a new school, Milam, for sixth grade in September 1946, Presley was regarded as a loner. The following year, he began bringing his guitar in on a daily basis. He played and sang during lunchtime, and was often teased as a “trashy” kid who played hillbilly music. The family was by then living in a largely African American neighborhood. A devotee of Mississippi Slim‘s show on the Tupelo radio station WELO, Presley was described as “crazy about music” by Slim’s younger brother, a classmate of Presley’s, who often took him in to the station. Slim supplemented Presley’s guitar tuition by demonstrating chord techniques. When his protégé was 12 years old, Slim scheduled him for two on-air performances. 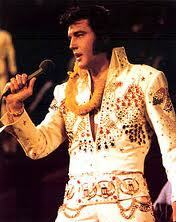 Presley was overcome by stage fright the first time, but succeeded in performing the following week. In November 1948, the family moved to Memphis, Tennessee. After residing for nearly a year in rooming houses, they were granted a two-bedroom apartment in the public housing complex known as the Courts. Enrolled at Humes High School, Presley received only a C in music in eighth grade. When his music teacher told him he had no aptitude for singing, he brought in his guitar the next day and sang a recent hit, “Keep Them Cold Icy Fingers Off Me”, in an effort to prove otherwise. A classmate later recalled that the teacher “agreed that Elvis was right when he said that she didn’t appreciate his kind of singing.” He was generally too shy to perform openly, and was occasionally bullied by classmates who viewed him as a “mama’s boy.” In 1950, he began practicing guitar regularly under the tutelage of Jesse Lee Denson, a neighbor two-and-a-half years his senior. They and three other boys—including two future rockabilly pioneers, brothers Dorsey and Johnny Burnette—formed a loose musical collective that played frequently around the Courts. That September, he began ushering at Loew’s State Theater. Other jobs followed during his school years: Precision Tool, Loew’s again, and MARL Metal Products. Presley, who never received formal music training or learned to read music, studied and played by ear. He frequented record stores with jukeboxes and listening booths. He knew all of Hank Snow‘s songs and he loved records by other country singers such as Roy Acuff, Ernest Tubb, Ted Daffan, Jimmie Rodgers, Jimmie Davis, and Bob Wills. The Southern Gospel singer Jake Hess, one of his favorite performers, was a significant influence on his ballad-singing style. He was a regular audience member at the monthly All-Night Singings downtown, where many of the white gospel groups that performed reflected the influence of African American spiritual music. He adored the music of black gospel singer Sister Rosetta Tharpe. Like some of his peers, he may have attended blues venues—of necessity, in the segregated South, only on nights designated for exclusively white audiences. He certainly listened to the regional radio stations that played “race records”: spirituals, blues, and the modern, backbeat-heavy sound of rhythm and blues. Many of his future recordings were inspired by local African American musicians such as Arthur Crudup and Rufus Thomas. B.B. King recalled that he knew Presley before he was popular when they both used to frequent Beale Street. By the time he graduated high school in June 1953, Presley had already singled out music as his future.